As this holy season of Advent begins, our Catholic faith reminds us that this is a time of preparation, a time to set our minds and hearts toward the coming of Jesus Christ. For many, the practice of prayerful reflection during this time is often disturbed by the chaos in our own lives and the lives of those around us. The four weeks of Advent are meant to help each and every one of us truly experience a season of hope and joyful expectation. It is in that spirit that I am compelled to write to you today. The news over the past few months of the tragic failings of the Catholic Church has been deeply distressing and has caused many to lose faith and trust. It continues to weigh heavily on our hearts. Personally for me, as your Bishop, I have prayerfully considered what I can do to help rebuild trust and forge a path to restoring and strengthening the faith. 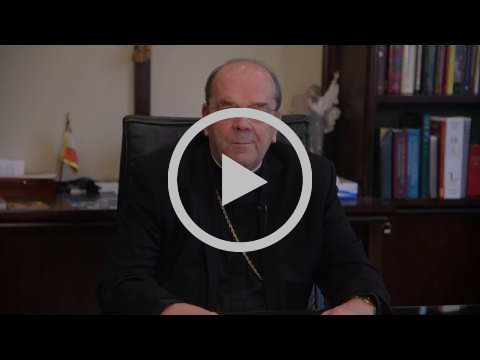 Many of you are aware that there is divisiveness in the Diocese regarding the release of the names of those with credible allegations of sexually abusing a minor. Over the years, I have explained that there are individuals who have been harmed who wish to have all of the names published and others who have explicitly asked to not have the name of their abuser made public. In order to respect their wishes, the name of an abuser was publicly confirmed only if the victim wished to make it known. Upon serious reflection and prayer, I have concluded that this practice has become a roadblock to moving our local Church forward. Additionally, I believe it is not fair to my successor whomever he is or whenever he comes, to leave him with this decision. On Monday, the names of those clergy who have had a credible allegation of sexually abusing a minor in the Diocese of Syracuse over the past 70 years will be posted on the Diocesan website, www.syrdio.org and www.thecatholicsun.com, our Diocesan newspaper. The list will include the names of both deceased priests and those living priests who have been removed from all ministry. There is no priest in active ministry with a credible complaint of child sexual abuse and any allegations received have been decades old. It is important to note that this list has been provided to the District Attorneys of all counties in the Diocese. Diocesan protocols established since 2002 involving the laity, law enforcement and other professionals are effective and the Diocese will not weaken its commitment to keeping children and young people safe. While I am aware that the release of these names will cause pain for some victims, families of the accused, friends and parishioners, I know that we are at a critical juncture in the history of our Church. It is my fervent hope and prayer that this effort will bring some peace and healing to those who have been directly harmed and to all members of our community of faith. As we enter Advent, let us pray for each other, as we are reminded that our only certainty at this time is the coming of the Lord Jesus.